One of the largest sporting events in the world of equestrian sports will take place in 2018 in the nearby community of Tryon, just 45 minutes southeast of Asheville, North Carolina. The 2018 FEI World Equestrian Games are expected to draw nearly 500,000 people from more than 70 countries to the Tryon International Equestrian Center, September 10-23, 2018. The Fédération Equestre Internationale (FEI), the worldwide governing body of equestrian sport, made the announcement in early November 2016. Much like the Olympics, the Games are held every four years and are second only to the Olympics in importance on the world equestrian calendar. Eight world championships will be decided during the 14-day event. The competitions include: Jumping, Dressage, Para-Equestrian Dressage, Eventing, Driving, Endurance, Vaulting, and Reining. Tryon will join an impressive list of cities to host the Games which include Stockholm, Sweden (1990), The Hague, Netherlands (1994), Rome, Italy (1998) and Normandy, France (2014). 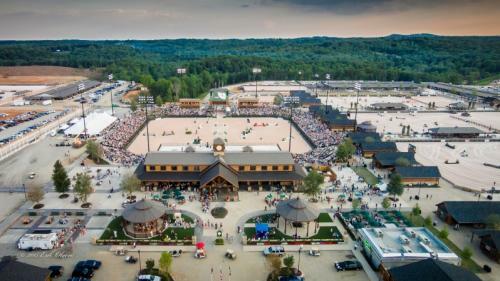 The Tryon International Equestrian Center, created by Mark Bellissimo, attracted the Games in large part because of its world-class facilities. The 1,600-acre venue features 1,200 permanent stables and 12 arenas. The arenas include a floodlit international arena capable of accommodating up to 12,000 spectators, with VIP seating for up to 1,500, and a covered arena that has another 5,000 seats. In addition, the International Equestrian Center has a top-notch cross country course used for Eventing and Driving, and it is surrounded by hundreds of miles of equestrian trails for Endurance. And, the facility is only continuing to grow. Under the leadership of Bellissimo, the Tryon Equestrian Partners (TEP) have invested more than $125 million as they work to turn the area into the “world’s premiere equestrian lifestyle destination.” TEP plans to invest another $100 million over the next two years leading up the Games. Asheville, North Carolina, is the largest city (pop. 87,000) within 45 minutes of Tryon. The easy drive can be done almost all on major highways (Interstate 26 and US Highway 74). Those coming to enjoy the 2018 FEI World Equestrian Games can choose from a wide range of accommodations in Asheville, including resort hotels, inns and cabin rentals. There are so many things to do in Asheville, before, during, or after the FEI World Games. Asheville has been called a “culinary and cultural capital with a thriving art and music scene.” Enjoy the booming downtown filled with local shops, renowned restaurants and craft breweries. The mountain community in Western North Carolina is also the site of America’s largest home, Biltmore Estate. In addition to tours of the 250-room historic home and gardens, Biltmore offers guided trail rides for everyone, from the experienced horseman to the first-time rider, on a gorgeous network of woodland trails. The Estate also features extensive Endurance trails and stable facilities. Other nearby horse riding stables such as Cedar Creek Stables and Sandy Bottom Rides offer great experiences for horse enthusiasts.